I've created a form for a married couple which has two columns with text input. Left side is for the female to fill out, right side is for the male to fill out, each of the questions should be aligned. I've been using 'shrink' in the text fields to try to line up everything. However, now I have a bit of a problem in that I need a checkbox to line up under the female text field on the left and one under the male text field on the right with each of the text fields above it. Unfortunately the shrink option doesn't help line them up correctly. Any way to do this? Let me know if you need anything else. Thank you! Sorry, spoke too soon. 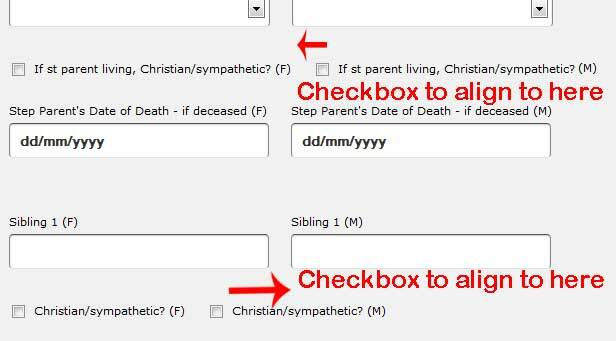 I tried to apply this CSS to other checkbox fields I added with their field ID, but it's not working. What am I doing wrong? Also, above the checkboxes I don't want any 'question label' text, but when I deleted the 'click to edit' text, I get insteed 3 dots '...' appearing. For the DOTS (...) thing, simply use use 'space' or this HTML code &nbsp; to completely remove them.